Cutwater Asset’s Cliff Corso expects another good year for equities. Why he likes fixed-income plays in munis and some high-yield bonds. Investors have been worrying about interest rates, which have been their good friend in recent years. But rates are poised to move higher; it’s just a question of when. And that raises tough questions, most notably how to handle fixed-income portfolios. 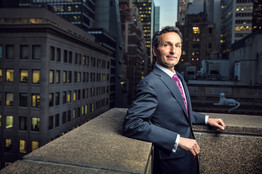 For insight,Barron’s spoke recently with Cliff Corso, CEO and CIO of Cutwater Asset Management, an Armonk, N.Y., fixed-income shop that manages about $25 billion. Corso, 52 years old, who’s been with the firm since 1994, maintains there’s still money to be made, even with rates rising. Look for yield, he advises, adding that he likes certain leveraged loans, high-yield bonds, and credits issued by money-center banks, such as Citigroup (ticker: C). Cutwater has a large institutional business, but one of its retail offerings is the Cutwater Select Income fund (CSI), which focuses on investment-grade credits across a variety of asset classes. The fund, which doesn’t use leverage, has a three-year annual return of 5.33% and trades at about an 11% discount to its net asset value. Barron’s : Let’s start with your macro view. Corso: We actually have a constructive outlook on the global economy and the U.S. economy for the balance of the year and into 2014. There are three big drivers. One is that global growth is picking up. In fact, growth across the globe this year is coming in just shy of 3%. But we expect that to pick up to a little north of 3.5% next year. The second driver is that the U.S. economy is poised to do better, and we expect it to pick up to perhaps 2.5% real GDP [gross domestic product] from around 2% that we’ve seen over the past couple of years. And the third driver is that, despite the likely tapering by the Fed next year, monetary policy likely remains very easy with the handoff from Ben Bernanke to Janet Yellen. Do you ever get any pushback from clients who say your outlook is too optimistic? It is actually ironic because, for the past three or four years, we’ve been below consensus on our GDP forecast. It is our multiyear view that the U.S.’s growth is evolving in a checkmark-like recovery pattern, starting out with a low slope at around 2%. So for the past three or so years, we’ve pegged our GDP figure somewhere in the low 2% range, whereas many economists have been starting their year with a forecast as high as 3% and have ultimately come down our way. We base our view on a growing global economy, which is positive for the U.S., supported by continued accommodative monetary policy here and increasingly abroad. And we see a broadening of confidence with consumers and businesses. What impact does all of this have on stocks and bonds? We are a 100% bond-centric firm, but that doesn’t stop us from having views on other asset classes, particularly equities. We have to do that. Late last year, we thought 2013 would be what we call the fulcrum year for equities, meaning that they would have a very solid performance, but they have done more than we expected. Our view was more around a 15% gain, but obviously equities are up about 25%. But we see another good year for equities in 2014, driven fundamentally by a growing global and a growing U.S. economy. We also see a continuation of the low-rate environment, though rates are poised to continue to rise somewhat. But in a low-yield environment, equities are poised to have another good year. There is a little bit of a debate as to whether equities are in a bubble. We don’t think so. We believe the growing economy equals growing earnings and likely Standard & Poor’s 500 [price/earnings ratio] expansion at the same time. So we could see another double-digit year in equities, notwithstanding that there may be a correction. But what about rising rates and the bond market? There are places to avoid and places that are still attractive, even in a rising-rate environment. Favoring risk, or yield, into fixed-income securities will buffer the corrosive effects that higher rates have on bond prices; you have that yield to help guard against rising rates. One area, in particular, that we like—and it has done quite well—is high-yield bonds, where we still see good value. The Barclays U.S. Aggregate Bond Index is down roughly 2% this year, versus a gain of 6% for the high-yield market. High-yield bonds have had a good run in recent years, but how sustainable are those gains? Often what can precipitate a high-default environment is when there are a lot of loans coming due in any given year. They call it the “maturity wall.” But in this low-rate environment, the high-yield companies have been very diligent about refinancing their borrowings out the maturity curve. So that wall of worry, which was originally somewhere around 2013 and 2014, has been stretched to 2016 and 2017. But that is something that we watch and that investors should watch. Still, borrowers have done a pretty good job pushing that wall out. The second thing to keep in mind, though, is that leverage is creeping up. But interest-coverage ratios are still very strong, and we expect they will continue to be strong. Still, one needs to be very careful about how management is viewing its balance sheet in terms of leverage. What will the 10-year Treasury be yielding in 12 months? The first thing I would say, because it supports our “risk-on” theme, is that rates are rising because the economy is getting better, and that’s a good thing for risk assets. This whole market has been trading for so long as if good news is bad news. We expect that 2014 will be the year where good news will be viewed as good news. But while we expect rates to rise, we don’t expect a blowout. In other words, we’ve seen a big chunk of the rate rise that we expected off of the taper tantrum, as it’s been called. Last spring, before the mention of a taper, the 10-year was yielding around 1.6%. Obviously, the taper tantrum caused a very dramatic jump in yields, with the 10-year touching 3%, versus 2.79% now, which is right around where it traded when the market fully expected the taper to occur in September—which, of course, it didn’t. So a lot of the tapering damage has been done. So where does the yield on the 10-year go? Although the correlation is very sloppy, nominal rates tend to follow nominal GDP, and nominal GDP, of course, is real GDP, plus inflation. And real yields are highly correlated to real GDP. So in 2014, where real GDP grows around 2.5%, we expect inflation to remain pretty tame, at about 1.75%. So that would bring the 10-year Treasury’s yield to 3.75% to 4%. And what about the yield on the 30-year Treasury? That yield is about 110 basis points, or 1.1%, north of the 10-year Treasury; that’s roughly where it has been this year. That spread could compress to about 75 basis points, or 0.75%. So, if I told you the average yield on the 10-year Treasury in 2014 will be 3.5%, we might see the average 30-year bond yielding about 4.25%, less than 50 basis points, or 0.50%, from today’s 3.89%. There’s a lot of talk about investors shifting money from bonds to stocks, perhaps signaling a great rotation. What’s your assessment? The great rotation is greatly exaggerated. If you look at the bond market, there are many, many players that invest, and, of course, retail investors do invest in bonds. But there is a huge institutional demand for fixed-income securities. That’s true if you look at insurance companies, which are heavy investors in fixed income, or pension funds, whether they are corporate or public, that invest heavily in fixed income. One of our themes is that while rates will rise, the long end of the curve will flatten with the aid of heavy demand from pension funds and other institutional investors. For pension funds, the best match for liabilities is long-duration, long-maturity fixed-income instruments. The higher rates go, the more attractive it is for pension funds to “de-risk” their liabilities by moving out of unpredictable equities and into the instruments that match their liabilities the best. What are the implications of a flattening yield curve? Investors should play defense and offense at the same time. Defense comes through buying instruments that have defensive properties against rising rates, such as floating-rate instruments. So we like leveraged loans, which reset periodically. By the way, we don’t believe that tapering equals actual rate increases. Tapering is just removal of accommodation by the Fed. The front end of the yield curve—the shorter maturities—which is more directly controlled by the Fed, probably will stay low for a couple of years. The No. 1 thing to underweight is the “risk-free” component of the bond market, primarily the Treasury market, particularly in the intermediate to longer-dated maturities. Treasuries don’t come with any extra yield to protect you. So they are more price-sensitive to rate increases. We are underweight Treasuries. In fixed-income sectors, we are cautious about retailers. Retail can be a pretty fickle business. Another area to watch out for, particularly in fixed-income, is M&A activity–that is, companies that may be poised to be taken over and levered up. Municipal bonds. If you look at the long end of the curve, people are afraid of rates. And so their first reaction would be to be afraid of the longer maturities. But if you look at long-dated, high-quality municipal bonds–for example, the state of Texas, which S&P just upgraded to AAA from AA-plus–you are getting above a 6% pretax equivalent yield. That is pretty attractive. Munis typically trade on a ratio to Treasuries, and the ratio for long 30-year, high-quality municipal bonds historically has been more like mid-90%, versus 110%-plus today. But when rates do rise, won’t the longer end of the curve be very vulnerable? As rates rise at the long end, you have two things going for you to soften that in the municipal-bond market. As I mentioned, we expect that as rates rise, there will be a flattening of the yield curve between the 10-year and 30-year, so we particularly like the 30-year part of that. In effect, what we see happening is that the 10-year yield moves up faster than the 30-year yield, narrowing the spread. The second thing is that as rates rise, we would expect that ratio that I mentioned–the one that measures the yield on a muni versus that of a 10-year Treasury—to compress. If it shrinks, say, 10% with a flattening curve, you might find that muni bonds don’t move in price at all, even though rates went up. What other bonds look attractive? We like the bank and finance sector. What is going on with the banks is not so great, arguably, for the equity holder, but it is pretty positive for the bond holder. More regulations and de-risking are all geared toward making the banks less risky. They are less levered as they have built up their capital. These companies went through a lot of stress testing, which is a positive for credit holders. Historically, the bank sector, in terms of its spread, has traded inside the Barclays U.S. Credit Index, a broad measure. That index currently trades at 130 basis points, or 1.3%, wide of corresponding Treasuries, and the banks have traded as tight as 75 basis points, or 0.75%. But today, because of all the damage that has occurred through the Great Recession and notwithstanding that credit is arguably better than it was, the bank sector trades cheaply to the overall credit index. Citigroup is a great example. Its 10-year paper trades about 133 basis points over the 10-year Treasury. That’s a little wide to the overall credit index, but it’s a good place to earn a little bit of yield in an improving story. And we are also positive on JPMorgan Chase (JPM) and Wells Fargo (WFC) bonds. So you draw a distinction between the bonds and the equities of these banks in favor of the bonds? Yes, we do. Equity is below bonds in the capital structure, and the equity holders get the last dibs on the cash flows. How about a few closing thoughts? There is a saying that history doesn’t repeat, but it certainly can rhyme. Taking a step back and looking at the average historical yield of the 10-year Treasury, it is more like 4%. That excludes the one period in the early 1980s during the Volcker era where he cracked the back of inflation. So we view that as an anomaly. So, as I said earlier, while we expect rates to rise, we don’t expect a blowout. People should operate in the parts of the fixed-income market that offer a defense against the level of rate rise that we expect, but they should also earn yield. At the end of the day, the dominant source of return in fixed income will come from yield, not price.